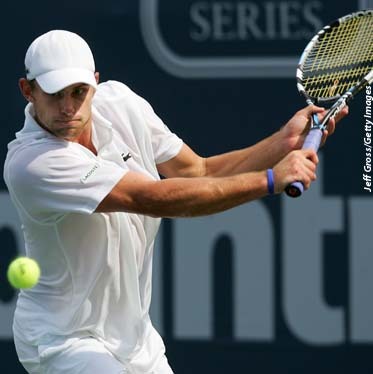 LOS ANGELES (AP) -- Top-seeded Andy Roddick took a methodical 6-4, 6-4 victory over Rik De Voest of South Africa in their first-round match Wednesday at the Countrywide Classic. Andre Agassi, the four-time and defending Los Angeles champion, bounced back from a first-set loss to defeat Swiss qualifier George Bastl 6-7 (4), 6-2, 6-1 in their night match. The 36-year-old Agassi, who has announced he will retire after the U.S. Open, took control of the match in the sixth game of the second set when he hit a lob that Bastl could only stand and watch land just inside the baseline. With the shot giving him three break points, Agassi gleefully skipped across the baseline to laughter and cheers from the crowd. He went on to break serve in that game, then won next seven games before the 31-year-old Bastl won another. The fifth-seeded Agassi finished the second-round match with 18 aces -- four in a row at one juncture in the first set -- as he kept most of his first serves down the center of the court and Bastl simply couldn't reach them. 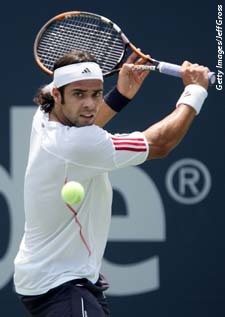 Third-seeded Fernando Gonzalez advanced to the quarterfinals with a 6-4, 6-2 win over Marat Safin. In another second-round match, No. 6 Tommy Haas defeated Paul Capdeville 6-3, 4-6, 6-1. Paul Goldstein extended his run with a 6-4, 6-4 victory over Igor Kunitsyn. Goldstein, who has never made it into the top 50 during his nine-year career on the ATP Tour, ousted No. 2 seed Lleyton Hewitt in straight sets the previous night. Roddick, with new coach Jimmy Connors watching from the second row in the stands, seemed able to turn his game up a notch when he needed to against De Voest, who is ranked 136th to Roddick's No. 10. Down 40-0 in the opening game of the second set, Roddick fought his way back and finally broke De Voest's serve when the South African double-faulted on the final two points. Then serving for the match, Roddick saved five break points before finishing De Voest with a tapped volley. Asked if Connors' watching made him nervous, Roddick said, "I'm excited, I don't think nervous is the right word. I'm eager to get out there and play because I'm eager to work on stuff." Roddick worked with Connors for several days before playing last week's tournament at Indianapolis, and Roddick made it to the final before losing to James Blake. Still looking for his initial win of the year, the 23-year-old Roddick believes he's making progress. "I'm feeling a lot better about the way I'm hitting the ball," he said after powering a number of hard groundstrokes past De Voest. "I don't think I'm halfway there yet. There's still a long way to go."